After creating a tournament, its embed code is available by clicking in the menu to the right of the bracket. Or, you can copy the following and replace YOUR_TOURNEY_URL. NOTE: If you're embedding a bracket on an HTTPS page, replace http with https in the code above. This is currently only supported for user-hosted tournaments, not organizations. You can append the challonge.com URL with options below for greater control over the look of your bracket. tab Set the starting tab. 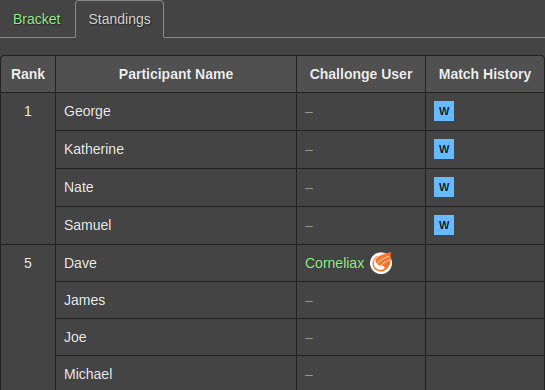 Tabs will be displayed for two-stage tournaments or when you enable the show_standings option. If unspecified, the active stage will be used. "groups", "final", "standings"
Check out these samples to see the versatility of the Challonge bracket module. The checkered background is for demonstrating transparency.